It’s a hot summer. My dogs are mostly indoors but we like to go out once in a while and enjoy the sunshine. Since dog’s don’t sweat, there are only two ways they can keep cool. The first way is panting. But when even the air they breathe is hot, panting can only do so much. The other way is to keep their body cool. That can be done by taking time out in the shade, giving them fresh cool water to drink, getting them wet or letting them swim in some cool water, or by putting on something cool like the Cool-It Pet Bandana. When I saw the Cool-It Pet Bandana, I just had to get one for each of my dogs. When we want to go out the park, I first put the Cool-It Pet Bandana in the freezer. When they are nice and cool, I put them around the dogs’ necks and off we go to the park. Obviously, Sephi and Maya still get hot, but the coolness of the Cool-It Pet Bandana keeps their blood cool. They didn’t have to pant as hard and enjoyed the outdoors for a little longer than they would have otherwise. 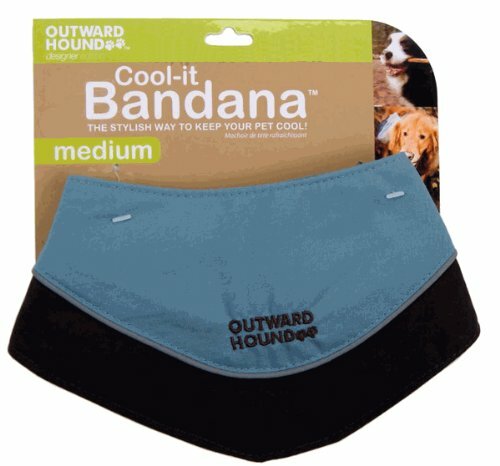 Even though the Cool-It Pet Bandana just ties around the neck, its coolness goes a lot further. As you may know, there is a big vein in the neck. The Cool-It Pet Bandana cools the blood in that main artery and the cool blood is carried throughout the body. Although the Cool-It Pet Bandana will help your dog enjoy longer fun in the sun, the Cool-It Pet Bandana may not be enough in extreme heat or extreme exertion in the heat. Don’t leave your dog in the hot car and watch your dog for signs of heat exhaustion. This entry was posted on July 23, 2011 at 7:17 am and is filed under Dog Leisure, Dog Products. You can follow any responses to this entry through the RSS 2.0 feed. You can leave a response, or trackback from your own site. My dog would probably really like one of these. He’s black and gets so hot outside in the summer. He’s hot after only 10 minutes of walking. I take him swimming whenever I can!